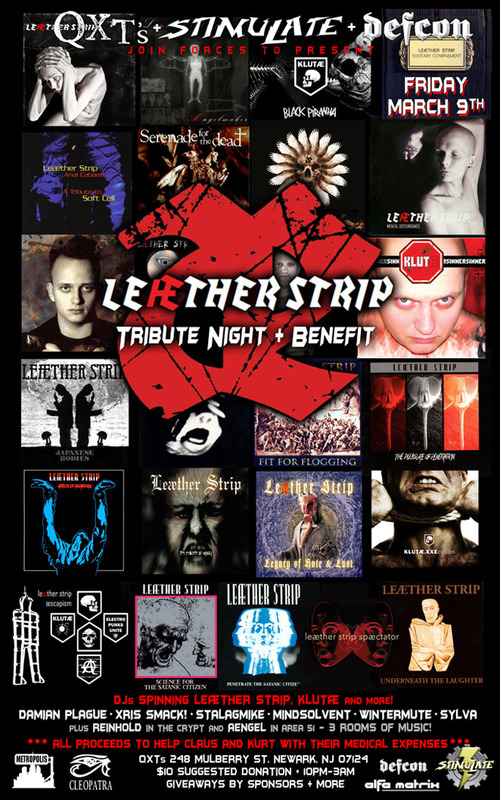 STIMULATE is very proud to to be a part of a Benefit for Claus Larsen AE and Kurt of Leaether Strip, uniting with QXT's (Official) and Defcon NYC Industrial this friday March 9th! ALL PROCEEDS from this fundraiser will benefit them towards help with emergency Medical Expenses, so please participate and donate to this worthy cause! :Benefit, Damian Plague, DEFCON, Defcon industrial, Defcon NYC, EBM, Fundraiser, Industrial, Industrial EBM, industrial Music, Leaether Strip, Leather Strip, QXT, QXTs, Stalagmike, STIMULATE, Stimulate NYC, Xris SMack!